I'd done enough waiting around to last me a long, long time. Friday I was definitely going fishing. However, a total lack of fish since the river's closed was sufficient disincentive to make me roll over and go back to sleep when the alarm clock went off. By the time I managed to crawl out of my pit the motivation had returned. Now indecision was nagging. Was it to be a Friday overnighter into Saturday on Longtail Pit or would it be a an afternoon/evening session on Cottontail? I fancied some rat-free peace and quiet, so it would be Cottontail. There was just one car in the car park when I arrived and, sure enough, the angler was about to set up in the very swim I had my hopes on fishing. No matter, with a lot still to learn about the pit any swim would do as I have no real clues to work from. The plumbing rod revealed a clean bottom shelving off steadily to fifteen or sixteen feet. I could have cast it further, but with a strong, very strong, north-easterly blowing into my face I'd never have reached the mark with my baits. I settled on an easy cast that I could also catapult out some groundbait to. 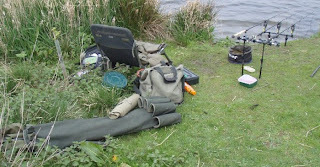 One reason for the session was to see which rod of three would be best for chucking method feeders. Truly testing conditions for the comparison! Of course this meant that my set-up looked a complete mess. One of the rods doesn't even have a final coat of varnish on the whippings. Although the reel seat has been glued in place. First of all I cast three baits out. Two method feeders, one fishing a 10mm Tutti the other two grains of plastic corn, and a maggot feeder with two plastic casters on the hair. The second job was to mix up the groundbait. I'm not too sure what it consisted of - I found it in a bucket in the garage... With that mixed I wound the method rods in and baited the feeders. Then I set about my third task of spodding out a dry mix of small trout pellets, old maggots, casters (erm, they were casters in with the old maggots actually), fresh maggots and a handful of 10mm Tuttis. With that lot in place the final task was to ball up some of the ground bait and catty it out. While in the process of balling up the feed a lad and his dad turned up and asked to pick my brains about the pit. This didn't take long as I know little about it except what I have been told - which may or may not be accurate. The dad thanked me, then asked if I minded answering one final question. "No. What is it?" " How do you get all that gear to your swim, do you carry it all in one go?" "Yep, pretty much." "You must go to the gym to work out then!" Laugh? Not half!!! I must admit that it's the groundbait and water for the kettle that adds the weight. Other than that it's not a big deal when my knees and hips work properly. Besides, on this occasion I'd walked less than 200 yards. When everything was set how I liked it, bait out, rigs on the spot, bobbins hanging with a five inch drop, I sat down and waited. The wind was blooming chilly and I was glad of the fleece and bunny suit. When the wind dropped briefly and the sun shone it was actually quite warm. With the trees greening up nicely there was another sure sign of spring - a fly in my first brew of the day. The summer migrants were in greater evidence too - terns, swallows and martins were all spotted. The frustrations of work (or waiting for stuff to work on) were forgotten and I concentrated on recasting the feeders at intervals. By all accounts the bream hadn't really woken up on the pit. The water felt pretty cold still, so I thought the deeper water I was fishing might produce the goods. I was actually quite confident. When the light went I had hoped to see signs of rolling bream on a glassy calm surface. The wind refused to abate, it just started to swing more to the east, then back again. The trees had been turned to silhouettes for an hour or so when the sounder box in the top pocket of my fleece bleeped once, the right hand bobbin having risen a couple of inches. Although the bobbin didn't drop back pulling on the line failed to reveal a fish attached. As I was adjusting the bobbin's hang the sounder burbled as the middle bobbin rose to the rod. Immediately I lifted into the fish the nod-nodding as I brought the fish in confirmed that I was attached to a bream. Not the world's biggest, it was still my first fish from the water so it got weighed and photographed. Although it wasn't big enough to justify a self-take an eight pounder would do me for starters on a new-to-me water. Carrying a few leeches suggested that the fish had just begun to get active. 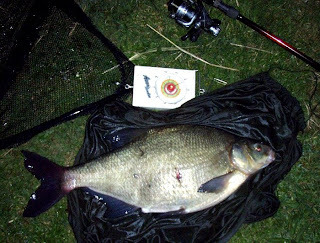 When the right hand bobbin lifted and held at the top, twitching slightly, twenty minutes later a second bream was landed. Smaller by a couple of pounds and also carrying a leech or two, plus what looked like a water snail on its dorsal. Both fish were as plump as you might expect at this time of year and quite silvery. The colouration probably being explained by the lack of clarity in the water, which had actually improved slightly from my first visit. Soon after all that it was time to head home, taking care to avoid the rabbits on the track back to the main road, now filled with enthusiasm to plan a speedy return.